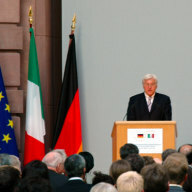 Since 1989 the IEP has organised German-Italian discussion fora (German-Italian Dialogue Forum, Villa Vigoni Dialogue and expert seminars). The aim is an ongoing exchange of ideas between high-ranking representatives of government and administration, academia and the business community of both countries. They discuss EU-related topics with a special emphasis on foreign and security policy, European Monetary and Economic Union, the social dimension of the EU and its processes of constitutionalisation. Partner organisations are: Istituto per gli Studi di Politica Internazionale/ISPI (German-Italian Dialogue Forum); Istituto Affari Internazionali/IAI and Compagnia di San Paolo (expert seminars on CFSP/ESDP) and German-Italian Centre Villa Vigoni (Villa Vigoni Dialogue). 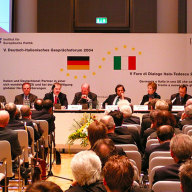 Conference in Milan, Palazzo Clerici, 26-27 October 2006 – A New Dynamic for Europe: The Role of Germany and Italy. 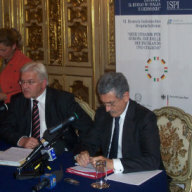 Germany and Italy: Partners in a Changing EU and in Facing Global Challenges.